The worst part about manual pourover coffee techniques—say, Chemex or a V60—are the paper filters you throw away after every single cup. Coava's photochemically etched metal Kone filter replaces them—and drastically changes the coffee at the same time. 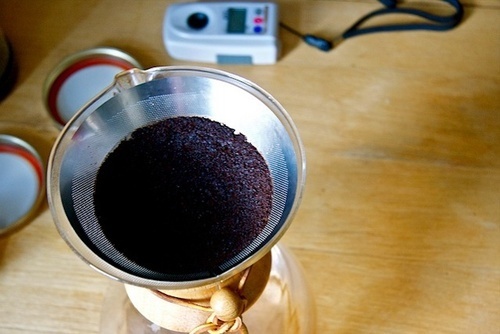 Coffee brewed via Chemex is typically noted for its brightness and clarity—thanks largely to the paper filter, which filters and absorbs a lot of the oils you would get in a heavier cup from, say, a press pot. Coffee that comes out of the Chemex using the Kone filter, on the other hand, is a crazy hybrid of the two says the NYT's Oliver Strand: "It gives you the control of a Chemex and the tannic cup you get from a French press: a Frenchmex...it was strange to find such an aggressive coffee sitting in my Chemex. It was like pulling the top off a bamboo steam basket and encountering a piece of grilled meat." Entirely manufactured in the US, Coava's already got 900 orders for the $50 cone—very possibly the latest piece of must-have gear for coffee fetishists always looking for new experiences.